I should have followed my Arroz a’la Valenciana post last Thursday with this. Afterall, what better way to cap off a Spanish meal, but with a Spanish desert. But housewifely duties came first, that is, cooking, cleaning and laundry, you get the picture. Everything happens for a reason they say. So last Friday, Veggie Girl had a brilliant idea of having a baking session together, wherein I bake and she takes the photos. We had fun even though baking is a challenge for both of us, for me especially. And I am happy to say that we were able to tackle two recipes in 3 ½ hours! That was important because Veggie Girl needed to get back home before a certain time to pick up the kids from school. And yes, we made it in time, considering we are both aspiring bakers, not bad. We did a 2-layer Red Velvet cake and Leche Flan. 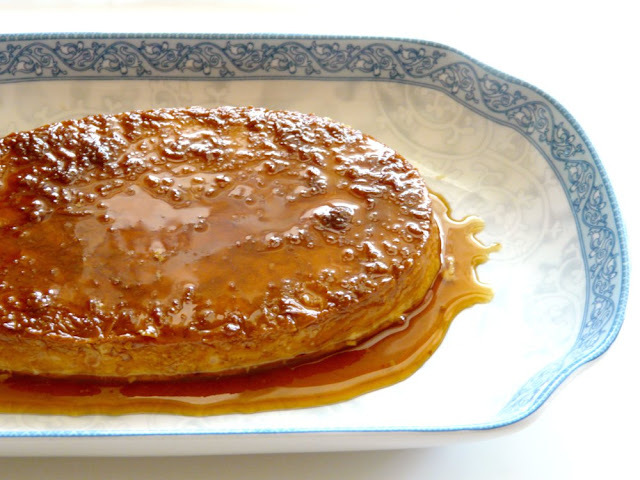 Leche Flan is a custard made of milk, egg yolks and sugar. Its closest relative would be Crème Brulee. I’ve inherited this recipe from friends and I’ve adjusted it according to my own taste. My method of making this is to steam it stove top which is the fastest way to make it. Some like to bake it but that takes a while, so this has been my method of choice. So, if you want to have a simple and quick Spanish themed party with a small group of friends, try the Arroz a’la Valenciana, which is a one-dish meal, and have Leche Flan for desert. You can also make this one day ahead, so you are not pressed for time the day of your party. Maybe for drinks, you can have some Sangria which you can just buy from the store, or you can make it yourself (hmmm…something I need to learn). Ramekins or any steamable container. The classic Filipino mold we use is what we call a llanera, which is an aluminum oval mold. I’ve tried using teacups to serve them as individual servings. 1. Fill up a flat bottom pan with about 1 inch of water. Cover the pan and start a steam on low heat. 2. Meanwhile, Separate the eggs. Tip: I used a spaghetti spoon to do that since my egg separator lets the yolk slip through. Some prefer to just flip the egg back and forth between the shells, but I always break the yolk from the sharp edges of the eggshells when I do that. Veggie girls prefers to just let the egg whites slip through her hands, and I’ve seen chefs do that in cooking shows, but I don’t like the way egg whites feel in my hands. Whatever method you prefer is fine. If some egg whites don’t get separated and blend with the egg yolks, don’t worry, it’s no big deal. 3. Add the evaporated milk and the condensed milk to the egg yolks and whisk lightly until smooth and well blended. Set aside. 1. Place ½ cup sugar in a non stick pan. Add water and lemon juice. Place over low to medium heat. Swirl the sugar around until it caramelizes. Sugar gets to be so hot during the caramelizing process so you cannot really do a taste test once it heats up. I just judge it by the color to know when it’s done. I prefer a deep dark golden brown color. 2. Pour the sugar into the pan/s. You just want to have a thin layer of it, just enough to cover the entire bottom of the pan. 3. 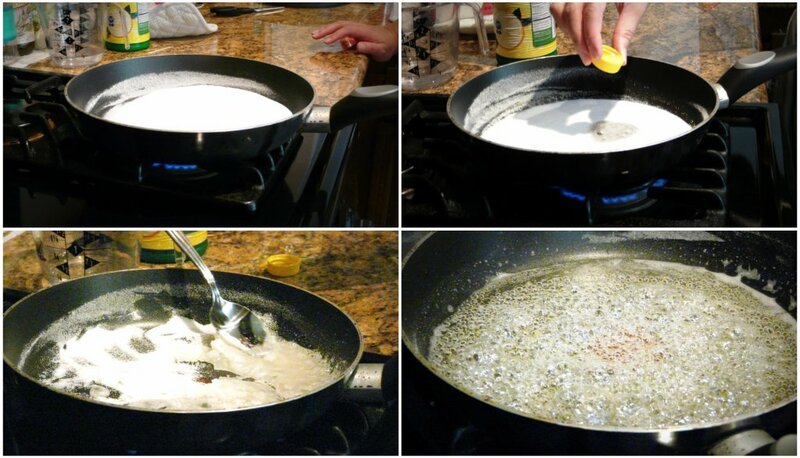 Pour the egg yolk mixture over the caramelized sugar in the pan and immediately place them in the steam pan. Steam for 25 minutes on low to medium heat. 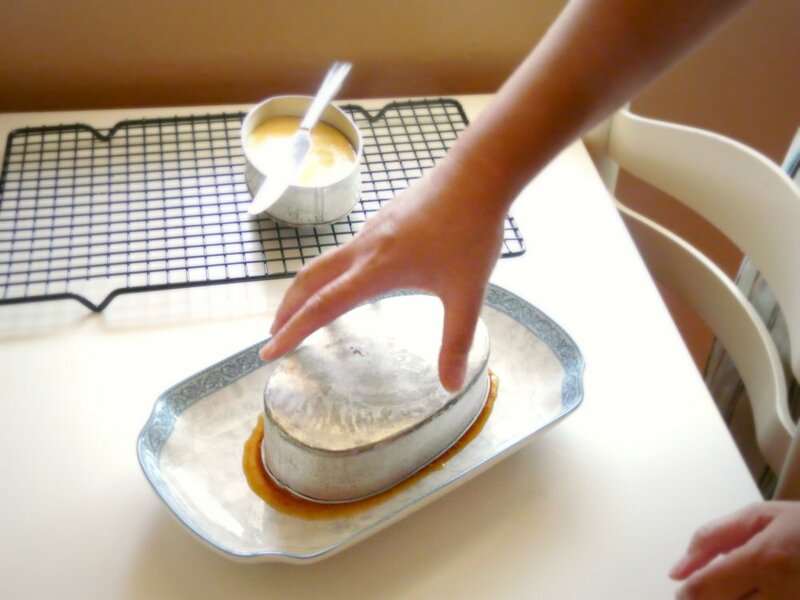 Make sure you time it right that your steam pan is already steaming by the time you get to this step, otherwise the sugar will harden at the bottom of the mold. Use any steamable mold for the flan. Traditionally, we use the aluminum oval llanera. 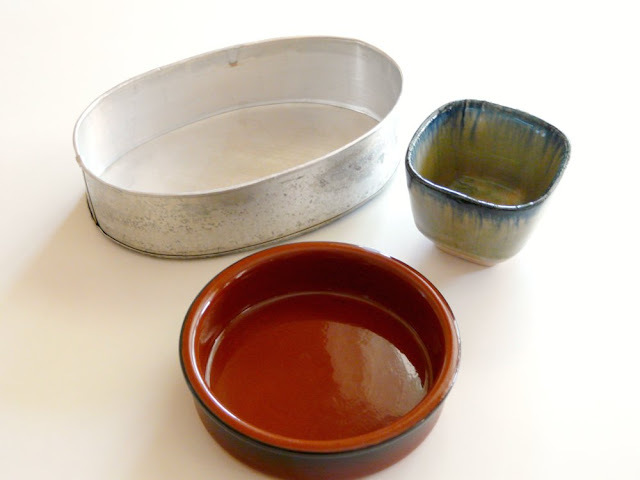 I have also used tea cups, and of course any kind of ramekin. I separated the egg yolks using a spaghetti spoon. Place a bowl in the sink and have the spaghetti spoon resting on the counter top with the scoop hanging over the bowl to catch the egg whites. Use a heavy object to keep the spaghetti spoon stable. In this case I used a full can of evaporated milk. Lightly whisk the egg yolks and whisk in the evaporated milk and condensed milk. 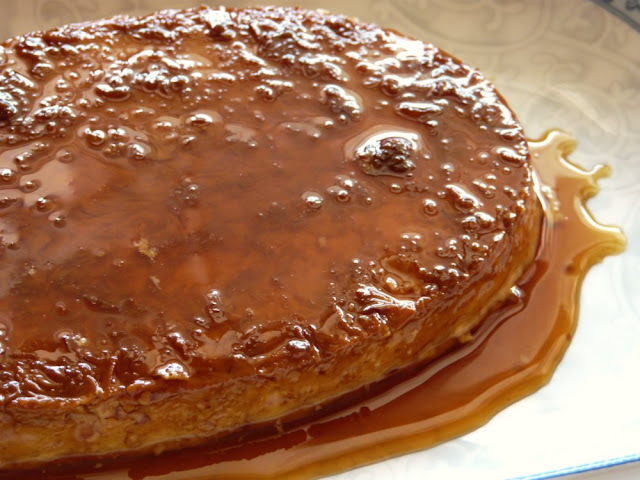 Caramelized Sugar: Place the sugar in the pan, add lemon and water. Swirl the pan around until the sugar melts and turns into a dark golden brown syrup. Pour the caramelized sugar into the mold. Pour the flan mixture over the caramelized sugar. Place the mold in the pan of steaming water. Cool the molds on wire racks. I like to do a taste test by carving out a small sample of the flan. The texture should be like soft tofu, where its soft and smooth, but firm enough to stand on its own. 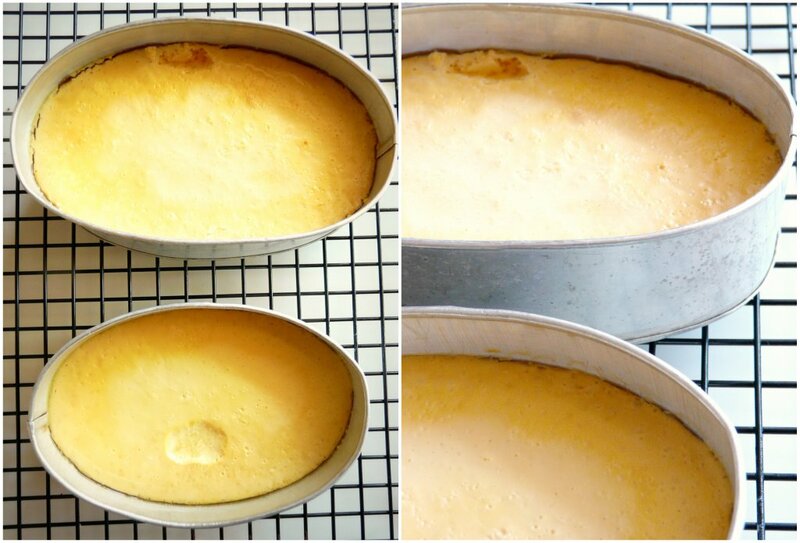 When cool, run a knife along the edges of the flan to separate it from the mold. Flip it over a serving dish and serve. I still have to perfect how to create a smooth top. But it tastes delicious anyway. Aside from adding flavor to the flan, I believe the acid helps the sugar from sticking to the pan.